Existing cut-offs for fasting plasma glucose (FPG) and post-load glucose (2hPG) criteria are not equivalent in the diagnosis of diabetes and glucose intolerance. Adjusting cut-offs of single measurements have not helped so we undertook this project to see if they could be complementary. We performed oral glucose tolerance tests and mean levels of hemoglobin A1c (HbA1c) measurements on 43 patients referred to a diabetes clinic for possible diabetes. Results of single and combined use of the FPG and 2hPG criteria were evaluated against the levels of HbA1c and results re-interpreted in the light of existing reports in the literature. 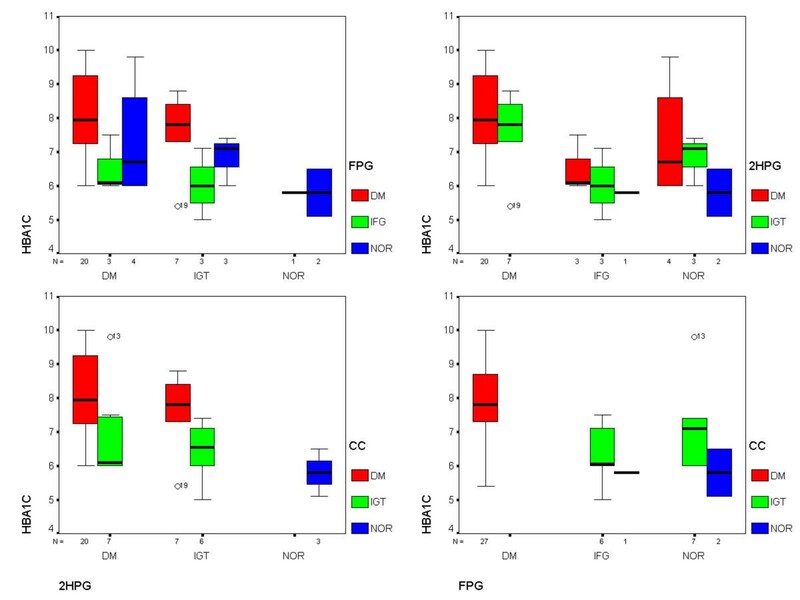 Our results confirm that the FPG and the 2hPG, being specific and sensitive respectively for the presence of glucose intolerance or diabetes, are not equivalent. They are shown to be indeed complementary and a re-definition of diagnostic criteria based on their combined use is proposed. We conclude that altering single measurement cut-offs for the diagnosis of diabetes and altered glucose tolerance will not result in better outcomes. We present the case for a combined criteria in the diagnosis and definition of diabetes with a FPG≥7 mmol/L AND 2-hour glucose ≥7.8 mmol/L being used to define diabetes while a FPG<7 mmol/L AND 2-hour glucose <7.8 mmol/L being used to define normality. Discordant values will define impaired glucose tolerance (IGT). This proposal requires prospective evaluation in a large cohort. Prior to the National Diabetes Data Group (NDDG) diagnostic criteria for diabetes in 1979, there were many different sets of criteria used to diagnose diabetes  resulting in a prevalence of diabetes that differed depending on the criteria used. In 1979, the NDDG recommended one set of criteria  which was modified by the World Health Organization (WHO)  in 1980. These criteria were selected based on the results of 3 prospective studies [4–6] in which subjects without diabetic retinopathy were given oral glucose tolerance tests and followed for 3 to 8 years, at which time 6% of them had developed this complication . Based on the 2-hour post glucose (2hPG) values of these individuals, a 2-hour glucose concentration of ≥ 11.1 mmol/L and a fasting plasma glucose concentration of ≥ 7.8 mmol/L were established as the criteria for the diagnosis of diabetes. In 1997, the American Diabetes Association (ADA) convened an expert committee to revisit these criteria . The committee lowered the fasting plasma glucose (FPG) concentration for the diagnosis of diabetes from ≥ 7.8 mmol/L to ≥ 7.0 mmol/L but decided to retain the 2-hour value of ≥ 11.1 mmol/L on the oral glucose tolerance test because a large number of epidemiological studies in the literature used this value to define diabetes and changing it "would be very disruptive". It seems clear therefore, that not only are these cutoffs not equivalent in their definition of diabetes but the increased emphasis given by the expert committee  on the fasting values may not entirely be optimal. One strong argument for this is that it has been demonstrated that isolated post load hyperglycemia is a strong predictor of mortality [10, 15, 16] and progression to diabetes, [13, 14] with prevention of progression to overt diabetes being possible in this group. Based on the data presented above, the fasting criteria alone will be unable to detect this intermediate group of glucose intolerance. This is not just a consequence of the fasting cutoff, since it has also been shown, from the pooled data mentioned above , that even if the fasting glucose threshold is lowered to 5.5 mmol/l, (thus detecting 93% of all those with diabetes diagnosed on the basis of 2hPG), its ability to identify IGT (sensitivity) does not improve substantially. It has therefore been concluded that the FPG, while being useful to confirm the overtly diabetic state, misclassifies many people with abnormal glucose tolerance as being normal . Since the latter group can be picked up by the 2hPG values, and adjustment of the fasting cut-off is of no additional benefit, it makes sense to use both measurements together in the in the definition of diabetes. We therefore evaluated their combined use for this purpose against mean levels of hemoglobin A1c (HbA1c) in our patient groups. This was compared with the use of single cut-offs for either the 2hPG (WHO) or the FPG (ADA) respectively in the definition of diabetes. The study was a diabetes clinic-based study on glucose intolerance in a small group of resident Kuwaiti and expatriate population in Kuwait. A random sample (n = 43) of visitors referred from a general clinic with a clinical suspicion of glucose intolerance or diabetes (unexplained constitutional symptoms in an appropriate setting [for example first degree relatives with diabetes] or symptoms of diabetes such as polyuria & polyphagia), aged 30 to 70 were included in the study. The OGTT was done by one of us (AP). Participants who were already treated for diabetes by insulin, oral anti-diabetic agents, or a physician-prescribed diet were excluded. Only 43 patients were recruited because we had allocated six months to data collection from the clinic. Patients are randomly allocated to each of five clinic physicians by the nursing staff and only new patients received by AP (n = 43 by six months) were included in this study. After 8–10 hours of overnight fasting, blood was collected for the measurement of FPG. Subsequently, a 75-g oral glucose (glucose tolerance test beverage, Fisher healthcare, Curtin Matheson Scientific, Houston, Texas, USA) tolerance test (OGTT) was performed and the plasma glucose level was measured 2 hours later (2hPG). The glucose levels were determined by means of the oxygen rate method employing a Beckman Coulter Oxygen Electrode (glucose oxidase method, Beckman Coulter Inc, Galway, Ireland). HbA1c was measured by the Beckman Synchron LX system(Beckman Instruments Inc, Fullerton CA, 92834-3100). This utilizes two cartridges, Hb and A1c to determine A1c concentration as a percentage of total Hb. The hemoglobin is measured by a colorimetric method and the A1c concentration by a turbidimetric immunoinhibition method. The normal range for the HbA1c in our lab is 4.3–5.9%. Weight and height were measured with participants wearing light clothing only, and the body mass index (BMI) was calculated as weight divided by the square of the height (kg/m2). Diabetes was diagnosed if the 2hPG was 11.1 mmol/L or greater, or the FPG was 7.0 mmol/L or greater. Impaired fasting glucose (IFG) was defined as a FPG between 6.1 mmol/L and 6.9 mmol/L and IGT was diagnosed if the 2hPG was between 7.8 mmol/L and 11 mmol/L. For the combined criteria the upper limit for the FPG (specific test) was combined with the lower limit for the 2hPG (sensitive test). Normality was based on the 2hPG value (<7.8 mmol/L) so long as the fasting value was concordant (<7 mmol/L). In the same way, a fasting value was used to define diabetes (≥ 7 mmol/L) so long as the 2hPG value was concordant (≥ 7.8 mmol/L). A discordant fasting and 2hPG value defines combined criteria IGT (cIGT). All basic statistical analyses were done with Epi-info 6.04d  which was also the database with a cutoff for statistical significance of 0.05. Graphics were charted on SPSS version 10 for Windows, SPSS Inc, 1999. 95% confidence intervals for the difference in means was calculated using Statgraphics Plus for Windows version 3.0, Statistical Graphics Corporation. The study population consisted of 33 men and 10 women with a mean age of 46.7 (SD, 9) years. Mean BMI (n = 42, anthropometric data of one patient was missed at initial visit) was 28.7 ± 5 kg/M2 (median 29, range 18.3–44.9). The results of sub-grouping of patients by different diabetes criteria are depicted in the figure and tables 1 &2. Boxplots of HbA1c by various diagnostic criteria. Subdivisions in each of these groups are depicted by different coloured boxes (red-diabetes, green-impaired, blue-normal). The box encloses the middle 50 percent of patients, and the median is represented as a horizontal line inside the box. The whiskers are lines that extend from the box to the highest and lowest values excluding outliers. The left and right plots depict 2-hour and FPG subdivisions respectively while the upper and lower plots depict comparisons against single and combined criteria clusters respectively (CC = combined criteria). There were two outliers (shown in the plots as circles with the patient number) and they were selected based on being more than 1.5 box lengths from the ends of the box, but were included in the analysis in tables 1 &2. Diabetes was diagnosed in the same percentage (63%) of patient's according to either of the single criteria or the combined criteria. One quarter of the diabetics by each single criterion were not diabetic by the other single criterion. The mean HbA1c (and 95% CI for the difference between means) of 2hPG or FPG subgroups within the combined criteria groups are reported. There were no significant differences in mean HbA1c between subgroups suggesting that the glycemic status within combined criteria groups was similar even for different FPG or 2hPG levels. Difference in means (95% CI for difference): a0.4% (-0.56–1.44), b0.5% (-0.95–2.03), c-0.8% (-2.2 – 0.6), all non-significantly different from zero. The difference in mean HbA1c and 95% confidence intervals for the difference between the means for the fasting and impaired subgroups of all three classification methods are reported. The implications of these differences are discussed in the text. Cutoff points such as those decided on by the ADA or WHO, allow the comparison of a dichotomy of a test variable against a relevant clinical endpoint. The test result however should be considered diagnostic of diabetes only if it separates those at a low and high risk for a clinically important outcome such as a specific microvascular or macrovascular complication. For example, the inherent risk for retinopathy, as demonstrated in epidemiological studies, was the rationale behind the derivation of the 2hPG of 11.1 mmol/L criterion . As the the HbA1c level at values ≥ 1% above the upper limit of normal (ULN) is associated with much greater development of progression of diabetic retinopathy or microalbuminuria, [21–24] its value correlates well with microvascular complications and was the standard in this study against which the various groups were evaluated. It may be pointed out here that although the use of the HbA1c in this way is useful (to define the glycemic status of patient groups with similar characteristics), it is not suitable for diabetes screening in individuals and cannot replace plasma glucose. It is true that the level of HbA1c is higher among diabetic than among nondiabetic persons, and among diabetic persons there is a correlation between HbA1c and various measures of glycemia, but this correlation seen in groups of patients does not hold for mildly hyperglycemic patients where the correlation is very poor, probably because glycemia proceeds at a slow rate and cannot reflect glycemia in toto . When the HbA1c has been used as a screening test for individual patients, as expected, it has an unacceptably low sensitivity  that results in very poor discrimination of normality, IGT and diabetes in individual patients. It has a good specificity , however, allowing its use for assessment of glycemic control in the follow-up of diabetics. Our results first demonstrate that IGT and diabetes by the 2hPG are unable to distinguish different levels of HbA1c (table 2), suggesting excessive overlap of these two groups. This is corroborated by other studies where approximately two thirds of individuals diagnosed as having diabetes by a 2hPG concentration of 11.1–13.3 mmol/L on an oral glucose tolerance test have normal HBA1C levels . In addition to such normal HBA1C levels, less than 5% will have HbA1C levels ≥ 1% above the ULN that predicts an adverse outcome. Therefore, 95% of these patients will have met the American Diabetic Association's goal HbA1c value of less than the upper limit of normal + 1%  and will be treated with diet and exercise rather than pharmacological agents. This is the same treatment that would be offered to patients with impaired glucose tolerance, (i.e., those whose 2hPG concentrations on an oral glucose tolerance test are 7.8–11.0 mmol/L). This is also corroborated by pooled data in 16 studies presented by Davidson et al  where patients with an HbA1c level ≥ 1% above the ULN have been shown to have a very high probability of meeting the 2hPG criteria for diabetes (>95%) while at the same time (as noted above) most of the subjects with diagnostic 2hPG do not have a HbA1c ≥ 1% of the ULN and approximately two-thirds would actually have a normal HbA1c. What are the implications of this? It is clear that the FPG <7 mmol/L provides no reliable information on whether an individual is normal or is at risk from future diabetes or future cardiovascular, eye or kidney disease related to diabetes. In a similar fashion, the 2hPG provides poor discrimination of those at future risk from the overtly diabetic patients with ongoing risk. This is again confirmed by the Funagata Diabetes Study in Japan, where the hazard ratios for all cause and cardiovascular mortality were higher for subjects diagnosed with diabetes according to the FPG than for subjects diagnosed according to the 2hPG. However subjects with IGT had a higher risk of cardiovascular mortality than subjects with IFG. These observations suggest that a diagnostic fasting value represents a level of glycemia that provides a high level of clinical certainty that the patient does indeed have diabetes, especially if it is elevated on two occasions , whereas the 2-hour criterion does not. In the same vein, a normal 2hPG provides a high level of clinical certainty that a patient needs no intervention, whearas the fasting criterion does not. It then becomes clear that to diagnose normality, impaired glucose tolerance and diabetes, we need a combination of these two criteria: One that favours sensitivity to exclude diabetes and the other that favours specificity to diagnose diabetes. The same result can not be achieved by adjusting cut-offs of single measurements. We acknowledge that our study is limited by the small number of participants. It is possible that in table 2, non-significance with the 2hPG could be related to the small number of patients. Nevertheless, the analysis in our combined criteria group had the same number of patients and this was even less in the FPG group but both reached statistical significance. In table 1, there were even smaller numbers compared in the cIGT groups, and it is possible that larger numbers may have attained a significant difference. This however seems unlikely for the FPG group where the mean difference was almost 1% higher in the normal group. We have cited the data in the literature extensively with our results, and the results from larger studies are not divergent from our data. Certainly, a larger trial is warranted to confirm the validity of this diagnostic approach. The 2hPG [≥ 7.8 mmol/L] is poorly specific for diabetes and only its combination with a FPG ≥ 7 mmol/L can be considered diagnostic of diabetes. In the same vein, a FPG [< 7 mmol/L] is poorly sensitive for diabetes and only its combination with a 2hPG < 7.8 can be considered normality. A discordant result (usually means FPG < 7 mmol/L and 2hPG ≥ 7.8 mmol/L as the reverse is uncommon) should then represent cIGT. Our results also clearly indicate that a combination of both criteria do complement each other in the definition of diabetes and propose these criteria (outlined in table 3) for the definition of diabetes, glucose intolerance or euglycemia. It can be estimated from the data in the literature that if these combined criteria are applied in a population, three-fourths of those with IFG will be re-diagnosed as normal by the combined criteria and 10% of those with normal FPG will be re-diagnosed as cIGT by the combined criteria. Assuming a 5% prevalence of diabetes and 10–11% prevalence of IFG in the community, equal numbers of patients with either IFG or normal FPG will switch categories by the combined criteria. That this switch is appropriate, is indicated by the similar mean HbA1c of the single cutoff subgroups within our combined categories in table 1, but will require larger studies to confirm this. We look forward to the results of prospective evaluation of this proposal in larger population based studies. Proposed combined criteria for the definition diabetes and impaired glucose tolerance. As expected in view of the small cohort, 100% of our patients with IGT by combined criteria had IGT1. 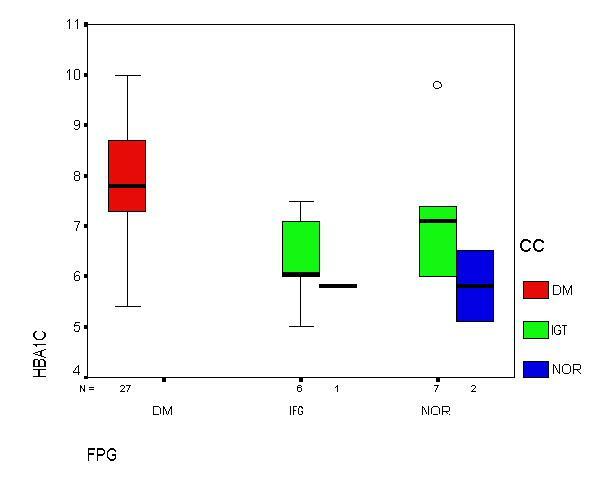 This would mean that FPG diabetics and 2hPG normals will have 100% concordance with the combined criteria diabetics and normals respectively (see figure). In larger cohorts there may be a minor discordance of FPG diabetics and 2hPG normals with the combined criteria (IGT2).